Dress up, protect, and refresh your old Parsons or Leather dining room chairs with these beautiful Deconovo Jacquard Dining Room Chair Cover. Each of these stretch slipcovers is crafted from a machine-washable polyester and spandex blend, making them easy to care for. Features a soft, form-fitting textured stretching fabric that is durable and resistant, fitting snugly over your chair for a sleek look. With an attractive Jacquard pattern available in a variety of appealing colors, the cover complements any space with refined elegance. As these slipcovers are made of waterproof and wrinkle resistant fabric, you no longer need to fear any spills and stains. You simply won't believe it's a slipcover, and now in a short dining chair makeup! Crafted with high quality 15% spandex and 85% polyester. Water resistant, spillproof and wrinkle resistant. Luxury textured Jacquard pattern instantly refreshes your chairs'look. Vibrant vivid colors to choose from: Beige, Navy Blue, Grey, Wine, Black, White, Chocolate, Light Brown, Turquoise. Will be fit for most chairs (back high 16"-23"; back width 15"-18". Seat length and width 16"-22"; and seat high of 1"-4"). 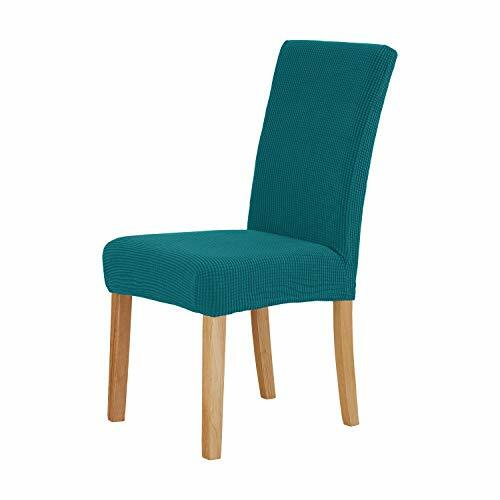 Ideal for dining chairs, restaurant chairs, hotel chairs, wedding celebration decorations, and many more. Do not bleach nor ironing. This super soft chair slipcover is flexible enough to perfectly fit any chair and stay secure thanks to the elastic edges. Ideal for chairs that measure between 16"to 23" back high and 15" to 18" back width. Seat length and width from 16" to 22" and seat high of 1" to 4"